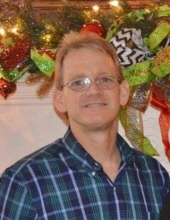 Curtis Stuart Roberson, 52, of Dunn died unexpectedly Wednesday morning at his residence. He was born in Monroe Co., GA on November 25, 1966 to the late C.A. and Ann Roberson. Curtis was a 1985 graduate of Dunn High School and attended Emmanuel College. He was in the family furniture business for over thirty years. He was the owner of the High Point Furniture Outlet in Fuquay. He was a commander of the Royal Rangers and a member of Gospel Tabernacle Church. Curtis enjoyed being with his sons, spending time with family and fishing. A funeral service will be held Saturday at 11 a.m. at Gospel Tabernacle Church by Rev. Allen Thomas and Rev. Josh Brown. Burial will follow in Greenwood Cemetery. He is survived by his two sons, Jacob and Adam Roberson of Lillington, a brother, Croswell Roberson and wife Nina of Raleigh, a sister, Patricia Roberson Smith and husband Marty of Coats, and several aunts, uncles, nieces, nephews, and cousins. The family will receive friends Saturday from 10 to 11 a.m. at Gospel Tabernacle Church. Memorials may be made to the Royal Rangers out Post 19, 2105 West Cumberland St. Dunn, NC 28334. To send flowers or a remembrance gift to the family of Curtis Stuart Roberson, please visit our Tribute Store. "Email Address" would like to share the life celebration of Curtis Stuart Roberson. Click on the "link" to go to share a favorite memory or leave a condolence message for the family.